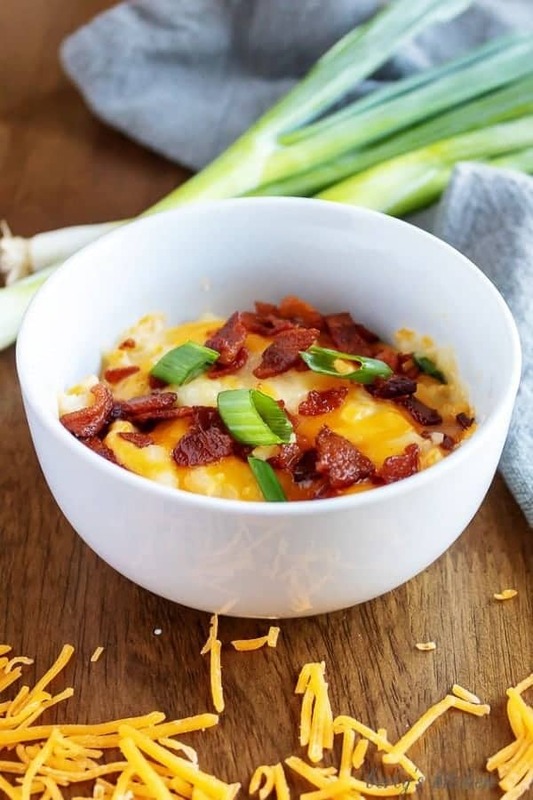 Loaded Mashed Potatoes are buttery, creamy, and topped with bits of crunchy bacon, cheddar cheese, and scallions. They’re a cinch to make and are on the table in no time. I can’t think of a better comfort food than a big bowl of homemade mashed potatoes. Mac and cheese comes close, but buttery, starchy mashed potatoes are a favorite. Personally, I’m a huge fan of a giant baked potato topped with plenty of butter and green onions, but John and Kale are fans of other potato dishes. 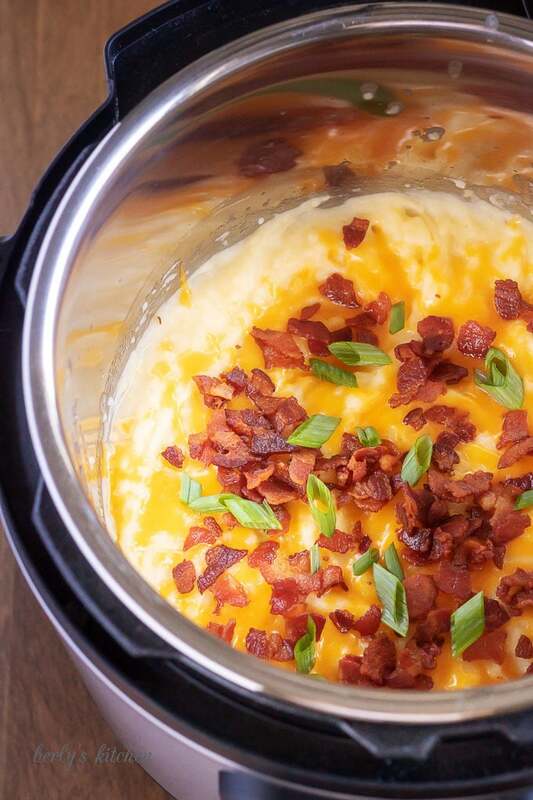 That’s why these loaded mashed potatoes are such a big hit. 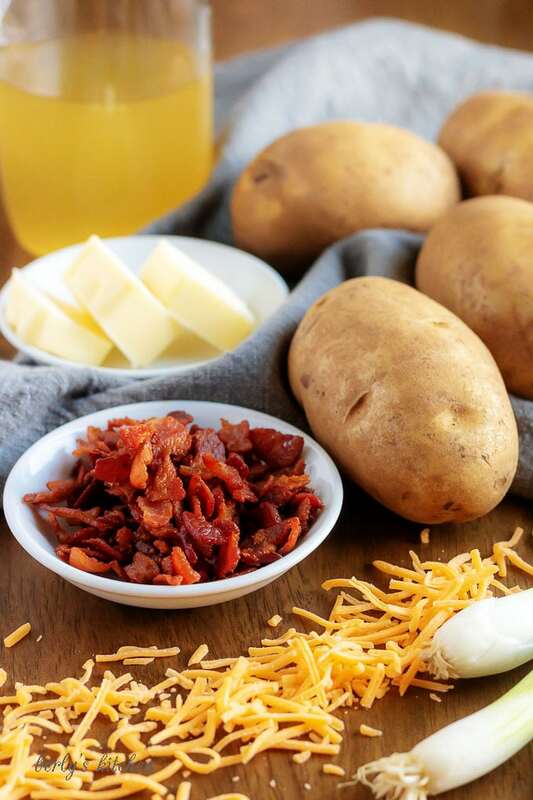 You can’t go wrong with perfectly cooked potatoes blended with butter and cheddar cheese. That’s not even the best part! The potatoes are topped with plenty of crispy bacon, more cheese, and fresh scallions. It’s almost like eating a creamy, baked potato. Not to mention, they’re made in the Instant Pot, so the potatoes are perfectly cooked, and it’s faster than stove top. 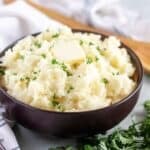 Perfect Garlicky Mashed Potatoes: These potatoes are rich and creamy with hints of garlic. This side dish makes a wonderful addition to any meal. Parmesan Mashed Potatoes: Warm and cheesy Parmesan mashed potatoes made with fresh garlic and nutty Parmesan cheese. It’s the perfect side to compliment any main dish. Now, back to this loaded potato recipe. We recently moved into a new residence, and in doing so, got a little behind on our blog work. We wanted something quick, easy, and tasty. This dish seemed perfect! You won’t believe how easy this recipe is put together. Start by cooking the bacon and breaking it into small pieces. While the bacon cooks, wash the potatoes to scrub away any dirt, then peel away the skin. Cut the potatoes in chunks roughly an inch in size. It’s important to cut all the pieces the same size, so they’ll cook evenly. We like to use russets for this recipe, but red, yellow, or gold potatoes would work, too. After the potatoes are cut, toss them into the Instant Pot. Don’t worry about a trivet or steamer basket. Just toss them in. Pour in the chicken broth, close the lid, and set the valve to sealing. Press the pressure cook/manual button and cook for 10 minutes on high pressure. After the timer goes off, let the pressure release naturally for 5 minutes before opening it for quick release. Remove the lid, add the butter and half the cheese. Use a hand mixer to blend the potatoes until they’re smooth and creamy. Top the potatoes with the bacon and remaining cheese. 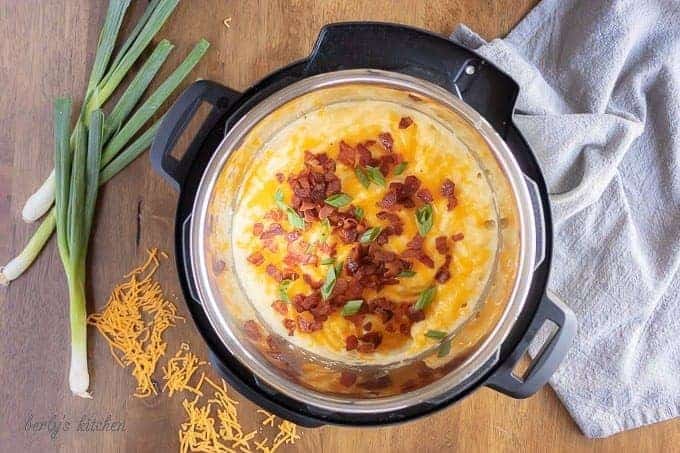 Close the lid on the Instant Pot to allow the residual heat to melt the cheese. It only takes 3-4 minutes. Remove the lid and top the potatoes with fresh cut scallions. Add additional salt and pepper if needed. Serve hot! Serve loaded mashed potatoes with a nice steak, grilled chicken, or pork chop for a complete meal. Sour cream, jalapenos, extra butter, or even ranch dressing all make great options for additions to these potatoes. Use your favorite cheese to customize the dish. Cheddar was our pick, but pepper jack, gouda, or white cheddar would be great choices. 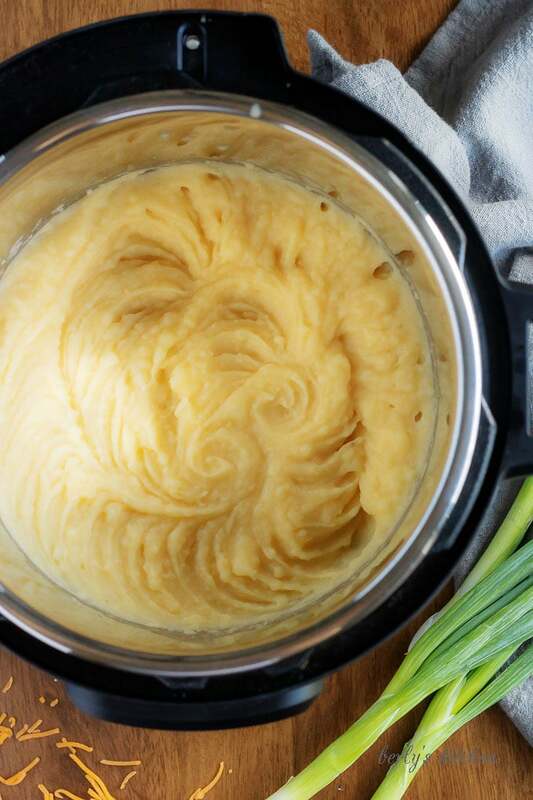 For a thicker mashed potato, reduce the chicken broth to 3/4 cup and the butter to 2 tablespoons. 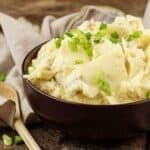 If you like this loaded mashed potatoes recipe, please leave us a comment and rate the recipe card. You can also find us on Facebook, Pinterest, Twitter and Instagram searching for Berly’s Kitchen! 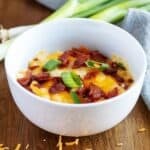 Loaded Mashed Potatoes are buttery, creamy, and topped with bits of crunchy bacon, cheddar cheese, and scallions. They're a cinch to make and are on the table in no time. Cook the bacon and break into small pieces. Set aside. While the bacon is cooking, wash and dry the potatoes. Then peel them and cut into 1-inch chunks. Add them to the Instant Pot. Pour in the chicken broth. Close the lid, and set the valve to "sealing." Press the manual/pressure cook button, and cook on high pressure for 10 minutes. After the time is up, allow a natural release for 5 minutes prior to opening the valve for a quick release. Remove the lid. Add the butter and half the cheese. Using a hand mixer, blend the potatoes until smooth. Add salt and pepper to taste. Top with bacon and the remaining cheese. Close the lid to allow the residual heat to melt the cheese. The takes about 3-4 minutes. Remove the lid and add the scallions. Serve hot! Leftovers can be stored in the refrigerator for up to 3 days. 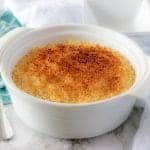 *See the post for additional information on variations to this recipe. *The potatoes are meant to be served as a side dish not an entree. *The calorie count and serving size is approximate. Loved these mashed potatoes! The only change I made was to use a 2 lb. bag of frozen diced potatoes to save prep time. Cooked them in my Instant pot and followed your recipe. Delicipus!